Marmalade Lane, Cambridge’s first cohousing community, is being delivered by TOWNhus, a partnership between TOWN and Trivselhus. Made up of 42 custom build homes complemented by first-class shared facilities, it will be a place of neighbourliness and community spirit. Marmalade Lane is a collective custom build development. Marmalade Lane will be a welcoming, inclusive community – near the centre of Cambridge, but a place where people will know their neighbours. It will be home to all sorts of people – young couples with kids, singles, and older people downsizing. Everyone will have a role to play in making Marmalade Lane a special place to live – and all residents will be invited to play a role in managing the neighbourhood once it’s built. Properties at Marmalade Lane range from one-bedroom flats to five-bedrooms houses laid out on streets around a shared-space lane and communal garden. Homes combine a modern look with impeccable build quality; all have high ceilings, tall windows and light interiors. The TOWN Custom Build approach allows residents to create a bespoke home to meet their requirements. Designed following fabric first principles and built using the Trivselhus closed timber panel construction, homes at Marmalade Lane are energy efficient and require minimal heating. Triple glazing, high levels of insulation and air tightness make homes more comfortable and energy bills lower. Renewable energy is provided by air source heat pumps. 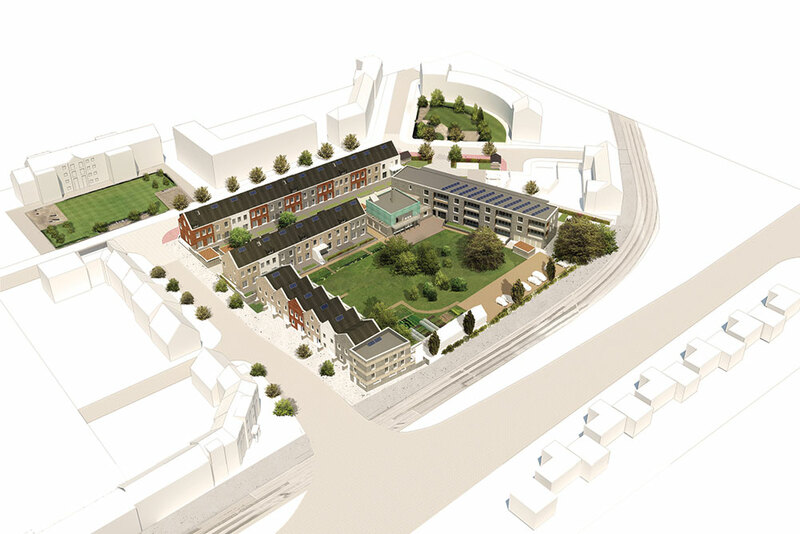 Homes at Marmalade Lane are laid out around a shared-space lane and a communal garden. Homes are privately owned, and almost all have private outdoor space, in addition to the extra communal spaces and facilities on offer. The Common House is a place for people to meet, eat and do their laundry. The shared garden a place for kids’ play and food growing. And the workshop is somewhere people can work, make stuff, and store tools. Located in the modern neighbourhood of Orchard Park, north of Cambridge City Centre, Marmalade Lane benefits from its own stop on the Cambridge Busway giving fast, direct access to the City Centre, and from a network of cycle routes to the city centre and the nearby Cambridge Science Park. The development is close to Junction 32 of the A14 and will have easy access to the new Cambridge North railway station. If you’d like to find out more about Marmalade Lane, please download the brochure, visit the Marmalade Lane website, or head over to the website of Cambridge Cohousing Limited for more information about how to become a part of this exciting development.